Charlotte, North Carolina has quickly emerged as a top retirement destination for active retirees. Active adult communities in the Charlotte area offer dynamic lifestyles in a four-season climate with generally mild winters. Many second chance retirees who originally moved to Arizona or Florida later relocate to Charlotte, North Carolina s age-restricted communities. Central North Carolina has proven such a draw to both retirees and non-retirees across the country that one out of every four Charlotte residents is a transplant, and the trend is unlikely to stop any time soon. Charlotte s 55+ neighborhoods have a vibrant sense of community that will appeal to retirees who want to keep active and working and maybe even return to the workforce or start a new career. Because of its location on the Gulf of Mexico jet stream, Charlotte retirement communities enjoy a humid subtropical climate warmer than most places at comparable latitude. Average yearly daytime temperatures are comfortably in the 70s. Summers are warm and humid, with summer daytime temperatures commonly reaching the high 80s. Only in January do the nighttime temperatures regularly dip just below freezing, although in December and February you may see occasional snow and ice. Charlotte is a sunny place. Most months average just three inches of rain, usually delivered by brief tropical thunderstorms except in winter. The total snowfall for most winters is well under one foot. Most of it melts on its own as the sun rises. However, outlying areas closer to the mountains can receive as much as two feet of snow. Charlotte s sunny weather means that outdoor activities are many and diverse. If the many golf courses in the area do not suffice, Myrtle Beach, the Golf Capital of the World, is just an hour away. The sun-soaked beaches of Hilton Head Island are also within an easy drive. Other popular outdoor activities in Charlotte include tennis, sailing, biking, horseback riding, and hiking in the Blue Ridge or Great Smoky Mountains. If kayakers find North Carolina s river systems too tame, try out the man-made rapids at the National Whitewater Rafting Center, located in Mecklenburg County, just west of Charlotte. At The Peninsula, a 55+ country club community just outside Charlotte, homeowners may join the Peninsula Yacht Club and take advantage of its state-of-the-art marina. Charlotte is the birthplace of NASCAR and the Nextel Cup. This heritage will be preserved in the NASCAR Hall of Fame, due to open in 2010. Drag races abound at the zMAX Dragway, a new NHRA dragstrip in Concord, while stock car races can be found at the Metrolina Fair racetrack. As the birthplace of Billy Graham, it should come as no surprise that the City of Churches is home to over 700 thriving religious communities covering a wide range of faiths and denominations. The majority of these are Protestant Christian, but even a traditional Latin Mass can be found at St. Anthony Catholic Church in Mount Holly. Charlotte also has two synagogues and a Jewish community center. Residents of the Charlotte area enjoy a cost of living index that is 90.7% of the national average. North Carolina income tax is collected at a flat rate of 5.8% and in 2015 it will lower to 5.75% with the possibility of further reductions in subsequent years. Retirees living in Charlotte s active adult communities do not have their Social Security income taxed nor does the state collect an estate tax. Real estate taxes are collected by the county. Continuing an active working lifestyle is just part of the high quality of life Charlotte has to offer older adults. Many who move here are not quite ready to hang up the office tie just yet. Charlotte s strong, diverse economy makes it easy for active adults to find jobs in a wide range of fields. 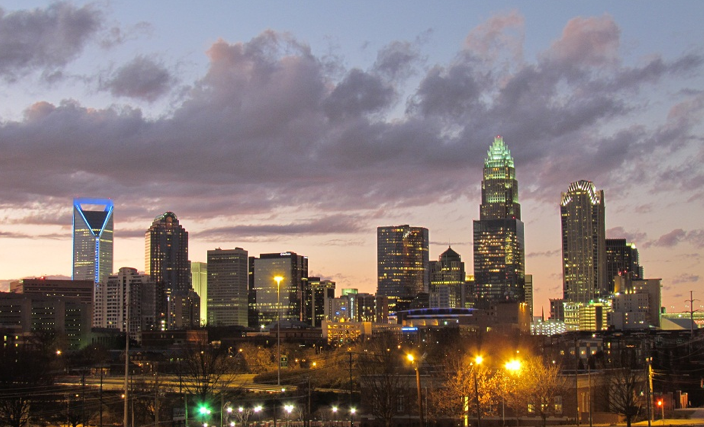 Charlotte also has nearly a dozen high quality hospitals and healthcare facilities. Duke Medical Center is consistently ranked among the top ten healthcare organizations in the country and many active adult communities are located nearby.